How to Measure Button Ligne in Apparel Industry? Button ligne calculation is an important task for the garment merchandisers. Improper button size can turns the garments into faulty garments. As its importance in readymade garments sector, today I will present here the button size measurement system with examples. Ligne means “line” which is a French word that became the standard reference used by German button manufacturers in the early eighteenth century. Ligne is expressed as “L” which is the internationally recognized standard. Ligne is used to measure the diameter of button. To measure the button size, we have to use ligne. If the button diameter is 15mm then what will be the size of button? So, button size stands at 24L. If the button diameter is 19mm then what will be the size of button? So, button size stands at 30L. By calculating in the above way, we can get easily the various button ligne according to button diameter. How to measure button size by ligne? Mention the button size chart. How to measure button ligne? How to measure button ligne in readymade garments sector? Mention the relation between Button Ligne, Millimeters and Inches. How to calculate button size by ligne? How to calculate button size (button ligne) in readymade garments sector? 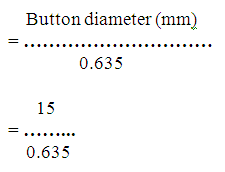 How do calculate button ligne from mm (millimeter)? Please always keep me with your new posts. This is very helpfull post. lot of thanks brother.